If you’re migrating to AbanteCart from another eCommerce platform, moving to an alternative platform from AbanteCart or you’re simply setting up your product range for the first time, you can take advantage of easy to use data import and export features available in the dashboard. You could import data into AbanteCart for a variety of reasons, including inserting new products and updating existing products with new information. Importing data is a quicker way to manage these tasks than manual addition or updating, especially if you need to work with many product lines. To review the settings, head to System > Data > Import/Export in the AbanteCart dashboard. As with most online store platforms, you import data into your AbanteCart store using .xml or .csv files. Typically, .csv files are created using a spreadsheet application, while XML files can be created using a text editor or a dedicated authoring application. The simplest way to update your product range is to first export the range from AbanteCart, make the changes you need in a spreadsheet, then upload the modified files back to AbanteCart. If you haven’t already, navigate to System > Data > Import/Export and ensure you have the Export tab open. 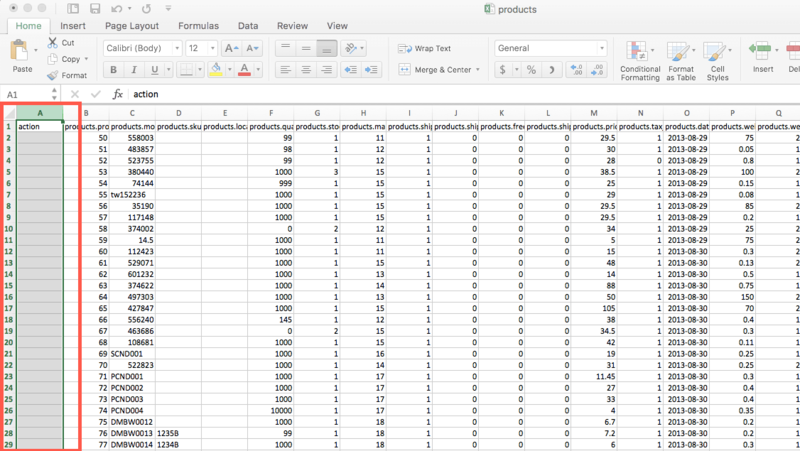 AbanteCart allows you to export a variety of data types, but in this example, we’ll be working with Products. Scroll down the tables list to Products and check the box to its left. 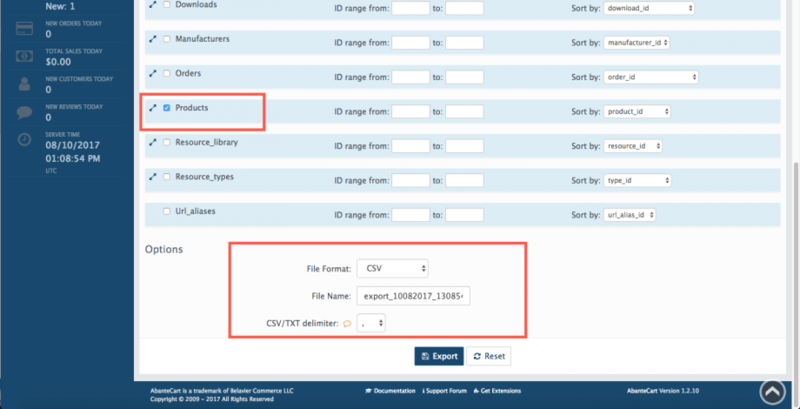 Choose a File Format for your export (.csv, .txt, .xml) and a File Name. Be sure to select the appropriate CSV/TXT Delimiter for your file, which is the character used to separate the exported data fields. In this example, we’ll be working with a comma-delimited .csv file. Your export file will be archived in the tar.gz format. Windows users will need to download an archiving application such as 7zip to unpack the file, while Mac OS and Linux users should be able to unpack the file natively. 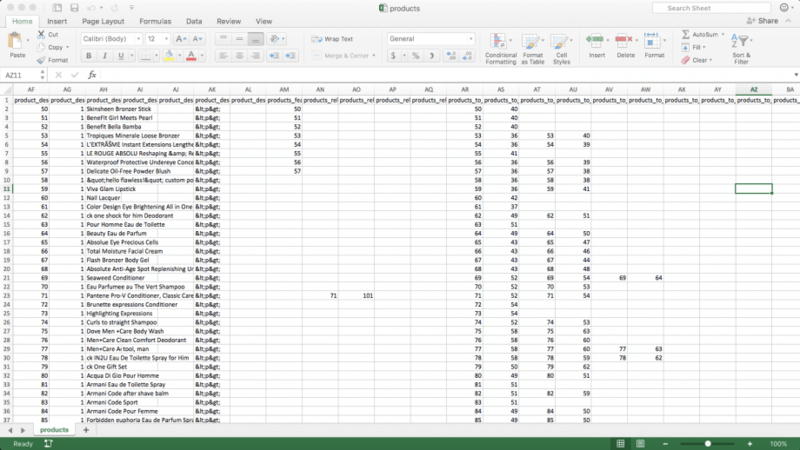 When you unpack the archive, you should see a products.csv file. Open it in a spreadsheet application such as Microsoft Excel or Google Sheets. Back in the AbanteCart admin dashboard, click the Import tab in System > Data > Import/Export. Click the Browse button to locate the file to import and ensure the CSV/TXT Delimiter is set to the same delimiter used for your file. 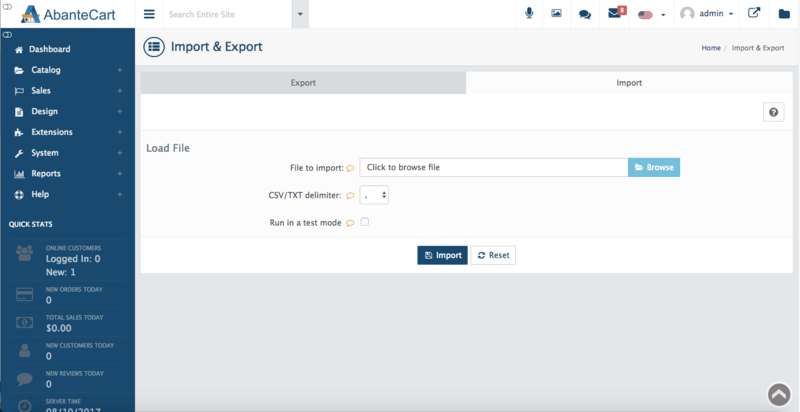 A Test Mode is available to allow you to preview import results without overwriting your data. When you’re ready, click the Import button to upload the file. You’ll receive a notification with the results of your import at the top of the screen. Adding new lines to your range involves similar steps to those taken when updating the range, but with some additions. Copy an existing row and paste it at the bottom of the spreadsheet to ensure the new product’s data is formatted correctly. To insert a new product, you’ll need to add a new column in your file, named action. Type insert into the action column. Ensure the product_id column is empty. Save the file in the same format and click the Import tab in System > Data > Import/Export. To export a file from AbanteCart, head to System > Data > Import/Export and ensure you have the Export tab open. Data can be exported from AbanteCart in XML, CSV and TXT formats and will be downloaded as a tar.gz file. Windows users will need to download an archiving application such as 7zip to unpack the file, while Mac OS and Linux users should be able to unpack the file natively. Data types such as Categories, Customers, Orders and more can be exported – in full or in part. If you only wish to export part of your database table, use the ID range from and to fields as well as the Sort by dropdown menu to target a range of records. Choose a File Format for your export (.csv, .txt, .xml) and a File Name. Be sure to select the appropriate CSV/TXT Delimiter for your file, which is the character used to separate the exported data fields.